The author, Sarah Elton, is a well known food writer. She also eats meat, although she truly understands the ‘other’ side. This, in my view, is the ideal perspective by which to write such a book. Balanced, in other words. It’s picture book size with loads of gorgeous illustrations by Julie McLaughlin, and tons of easy to digest info. 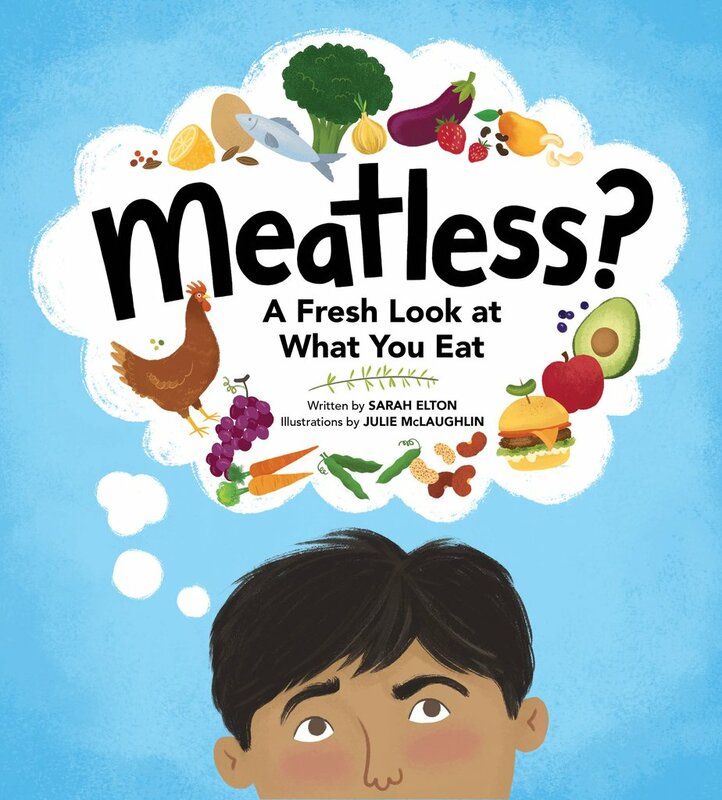 Really the most brilliant tool to start a chat with kids about veggie-ism, before they get their ideas on the schoolyard or to clarify some already-got misconceptions. ♦ It was Pythagoras that came up with the germ of the idea that became veggie-ism. He felt animals were reincarnated humans. ♦ 20 million pigs are killed EACH YEAR in Canada. ♦ There’s a terrific section on food combos that create complete proteins (for the days you choose not to eat meat). Beans, rice, legumes… nut cheeses. All of which are equally nutritious in terms of protein, but much cheaper. Good for students and families who need to make their food dollars stretch. A few meatless days a week = money saved. ♦ Gallo Pinto is a beans and rice dish that I want to make. The name means spotted rooster. ♦ There is a small section on animal welfare, the reality of factory farms, overcrowded stalls, pens, and feedlots, and animals that can barely move. And before everyone starts wringing their hands about how the wee ones mustn’t be traumatized by the truth and that surely it’s better they believe ‘meat’ has nothing to do with animals… that, instead, it arrives by pelicans, already saran-wrapped at Costco or delivered with pickles in a burger under golden arches… and that the animals that are used to create such happy ‘bargain food’ have indeed lived sunny lives… let’s remind ourselves that country children grow up knowing where meat comes from and they somehow manage to understand, and survive the info..
Tell kids the hard truth about unethical meat farming, I say. And, harder still, tell ourselves while we’re at it. Like Elton, I’m a meat eater, though it’s not a huge part of my diet and I can easily go a week without missing it or even noticing that I haven’t eaten any. I’m not a vegetarian but I do care about where my meat comes from. I care about how the animal lived and died and I care about its food source. I care about over-production and over-consumption and waste and I continue to hope that the big players, the golden arches, the chicken purveyors and bacon mongers, will one day insist their meat suppliers follow more humane practices because, mostly, I care about responsible farming practices. I hope, too, that maybe some of us will consider the effects of supporting the alternative. And given that information, we make our choices. That’s really what this book is about… the idea of informed choices. Meatless? : A Fresh Look at What You Eat can be ordered online at Hunter Street Books.